﻿NEXT UP: AZBC ARIZONA BADMINTON CHAMPIONSHIPS! - Sat, Apr 13 (Kids events & Open & Senior Doubles events) and Sat, Apr 20 (Open & Senior Singles & Mixed events)! Email GCoachGC5@cox.net for the entry form. Dec 8, 2018, Mesa... The 2018 HOLIDAY FUN! BOWL and HIGH SCHOOL BOYS STATE BADMINTON CHAMPIONSHIPS filled the AZBC courts with great competitive action, lots of fun, great prizes and tournament shirts. 80 players, 130 matches, 8 events. The high school boys had the largest turnout and highest level of play yet in the 7 year history of this event with 20 boys representing 8 different schools. Congratulations to the 2018 HS BOYS CHAMPIONSHIP TEAM: SAHUARO HIGH SCHOOL OF TUCSON (2 Coaches on the left, and 6 players, center; along with individual champions: BOYS SINGLES: PHUC LY of MARICOPA HIGH SCHOOL (2nd from right) and BOYS DOUBLES: PHUC LY & ALXS GALIT of GOLDWATER HIGH SCHOOL (on right)! Individually, left-hander Phuc Ly of Maricopa High School set a new standard of excellent play and took both the singles and the doubles titles, with Alxs Galit of Goldwater High School. But the team title went to the 6-player team of Sahuaro High School with 50 total team points, with Perry High School coming in 2nd with 39 points. Other standout play came from Michael Liang of Basis-Mesa who was runner-up in the boys singles. In the Holiday Fun! Bowl portion of the tournament it was great to see the Kids division battle with Flora Tao winning both the Kids Mixed-Up Doubles with Samarth Dunakhe and the Kids Doubles with Nihira Sane. Recently retired professional baseball player and newcomer to the AZBC, Anthony Phillips, drew on his youth badminton experience from South Africa and recent badminton training to capture both the Open Mixed with Alexis Mee and Open Doubles with Chacko Kuravilla. Alexis Mee also won the Women Doubles with Tiffany Lok. Sep 8, 2018, Mesa... The 26th annual SMASH BASH DOUBLES BADMINTON TOURNAMENT displayed, yes, SMASHES, SMASHES and more SMASHES (along with 1000s of all the other shots)! 99 participants battled their way through doubles and mixed events for kids, high school players, adults and seniors. We even had a "Young & Old Men Doubles" and a "Young & Old Mix Mash." There was only 2 double winners in the whole tournament: Theo Hashimoto with her husband, Steve Hashimoto, in the Open Mixed and with Hitomi Sato in the Open Women Doubles; Steve also won the Young & Old Men Doubles with Chacko Kuruvilla. Hitomi and Hiroki Sato, Open Women Singles & Open Men Singles Champions, and Open Mixed Champions together! Apr 14 & 21, 2018, Mesa... The 7th annual Arizona Badminton Championships were held at the Arizona Badminton Center over two Saturdays. The competition was the deepest ever with 100 competitors battling it out in more than 20 events, including the signature Open Women and Men Singles, Open Women and Men Doubles, and Open Mixed Doubles. The open champions are forever etched on the large perpetual plaque in the lobby at the Arizona Badminton Center! The stars of this year's state championship tournament were the husband and wife team of Hiroki and Hitomi Sato, who won the Open Mixed Doubles together, and the Open Men Singles and Open Women Singles titles individually. The Open Women Doubles was won by Ashley Nam and My Ta. The Open Men Doubles title went to Tejas Ashani and Hirokazu Sato. All of the draws were extremely difficult highlighted by numerous 3-game matches. There were also Kids events in singles, doubles and mixed for the under 11 and under 14 age groups, "B" level adult events, and Senior events for 40 and older! Open Mixed Doubles- Hiroki & Hitomi Sato def. Duc Dinh & My Ta, 21-19, 21-19. Feb 10, 2018, Mesa... Maybe the biggest and baddest JIM POOLE CLASSIC yet! More than 80 players, including 21 kids under 13, participated in non-stop competition from 9am to 8pm. Players from Tucson and California also spiced up the action. There were lots of exciting, well-played matches! The tournament started with 1/2 court singles, 7-point games-- with Neil Chen (Men), Lucy Timothy (HS Girls), Luke Wang (Kids/Boys), Kiseki Hashimoto (Kids/Girls), Sherry Yuan (Women), and Naren Koka (Master Men) winning each of their Singles draws (see photo at left, from left to right). Then, all the Kids Doubles, HS Girls Doubles, Open Women and Men Doubles, and Master Women and Men Doubles filled the courts for the next 5 hours. Kids/Girls Doubles were won by Flora Tao/Mohitha Jayajaran; Kids/Boys Doubles by Arya Saravanan/Luke Wang; HS Girls Doubles by Payton Foti/Sidney Nguyen; Open Women Doubles by Jacky Myers/Theo Hashimoto; Master Women Doubles by Brenda Nguyen/Sherry Yuan; Open Men Doubles by Seigo Hashimoto/Ricky Nguyen; Master Men Doubles by Naren Koka/Doug Towne. Finally, to cap off the day was the Open Mixed and Master Mixed with Steve and Theo Hashimoto outlasting their competition for the Open Mixed title and Pedro Garcia-Flores/Jacky Myers winning the Master Mixed. There were also consolation for all the events. Great play, food and prizes, and lots of fun! The Sahuaro High School boys team from Tucson came in force and took the 2017 BOYS HS STATE CHAMPIONSHIIP TITLE! Dec 9, 2017, Mesa... Always a great way to start off the Holidays, this year's HOLIDAY FUN! BOWL held 7 action-packed events, including the 6th annual BOYS HIGH SCHOOL STATE BADMINTON CHAMPIONSHIPS, Open Men and Women's Doubles, B Women's Doubles, Senior Men's Doubles, and a first-ever CRAZY MIXED UP DOUBLES with 2-on-2 half-court wacky play! The BOYS HS CHAMPIONSHIPS had 16 boys from 5 different schools vie for Singles, Doubles and the Team title. For the first time ever, Tucson entered a boys team from Sahuaro High School and came ready to play. Sahuaro took the Team title led by Boys Doubles Champions, Travis Cole & Landon Ogle, with additional teammates, Josh Bladh, Dominic Erickson, Parker Glasser, Sebastion Kanizsai and Ronald Sabatino all contributing points. Finishing 2nd was Perry HS led by Gabe Wilson who earned the Boys Singles title, along with teammates, Christian Copic, Griffin Haugen, Cooper Richter, and Jaden Tan. Finishing 3rd overall was Gilbert Classical Academy with Kaleb Thompkins, 4th - Marcos de Niza HS with Callahan Farr and Cameron Sordia, and 5th- Basha HS with Damon Nguyen. The Open Women Champions were Ashley Nam and My Ta winning in the finals over Alexis and Jodyn Mee. "B" Women Doubles were won by Jordyn Mee and Rujuta Sane over Lucy Timothy and Tore Burton. Open Men's Doubles Champions were Avi Mammidanna and Tejas Ashani over Arvind Renukaradhya and Dean Glazeski. Senior Men's Doubles was won by Roger Goettl and Mike Hilliard over Richard Alcaraz and Doug Towne. And finally, the CRAZY MIXED UP DOUBLES was won by Avi Mammidanna and Byron Mee-- Byron's first tournament win under 10 years old! Sep 9, 2017, Mesa... Celebrating the 25th anniversary of the SMASH BASH was a blast with jam-packed action from start to finish. Lots of great matches, upsets and new winners and big smiles as displayed by Doug Towne and Marsha Morris to the left (photo courtesy of Doug Towne). JVGD: Connie Devenport/Jordyn Mee def. Katie Pryor/Eve Taylor, 24-22, 21-11; VGD: Connie Devenport/Gabrielle Nakada def. Jordyn Mee/Cecilia Roessle, 21-12, 21-16; OWD: Wey Lin Lee/Marsha Morris def. Alexis Mee/Ashley Nam, 20-22, 21-13, 21-8; HSBD: Shakir Dixon/Harry Saez def. Roberto Arizmendi/Gabrielle Nakada, 22-20, 17-21, 22-20; OMD: Sumit Arora/Rick Nguyen def. Ramesh Bondalapati/Eric Cai, 21-19, 22-20; BMD: Cameron Ohoro/DJ Peters def. Ashish Gopalakrishnan/Richard Alcaraz, 21-17, 25-23; SMD: Ramesh Bondalapati/Eric Cai def. James Siby/Joseph Vadakkel, 21-16, 21-10; OMX: Mitch Nase/Alexis Mee def. Doug Towne/Marsha Morris, 21-16, 19-21, 21-19. SMX: Ramesh Bondalapati/Sherry Yuan def. Doug Towne/Marsha Morris, 21-17, 21-10. Avi, Priya, Vaishnavi, Tejas, Chinmai, Kiyoko, and Art -- some of the winners and finalists at the 2017 Arizona Badminton Championships. April 15 & 22, 2017, Mesa... The annual AZBC ARIZONA BADMINTON CHAMPIONSHIPS serves as the state tournament to determine the best players in each of the primary disciplines of badminton-- women and men singles, women and men doubles and mixed doubles. Each year we honor these champions with their names on our perpetual plaque in the lobby. This year also saw the largest number of participants in our history with nearly 100 entries. Along with the Open events, there were also "B", Senior, and the largest turnout of Kids in their age groups of U9, U11, U13, U15. The kids showed much improvement in skills and temperament on the court, too! They had a blast! OWS: Priya Nair def. Vaishnavi Koka, 21-19, 21-14; BWS: Gabrielle Nakata def. Elizabeth Palmo, 21-7; OMS: Chinmai Basavaraj def. Tejas Ashani, 21-15, 21-12; BMS: Abdul Hannan Rana def. Charles Wang, 21-18; SMS: Francis Hartojo def. Chacko Kuruvilla, 21-18; OWD: Kiyoko & Theo Hashimoto def. Vaishnavi Koka/Priya Nair, 22-20, 21-18; BWD: Connie Devenport/Ekta Kulkarni def. 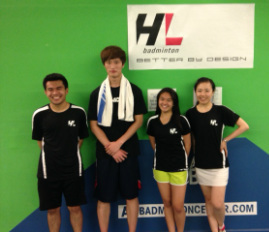 Angela Chen/Elizabeth Palmo, 21-11, 21-6; OMD: Sumit Arora/Avi Mamidanna def. Rick Nguyen/Aaron Romualdez, 21-9, 21-15. BMD: Khadar Shaik/Shandy Popuru def. Doug Towne/Paul Varghese, 21-15, 21-12; SMD: Chacko Kuruvilla/Doug Towne def. Ramesh Bondalapati/Warren Mee, 21-10, 21-14. OMX: Art Solo/Kiyoko Hashimoto def. Avi Mamidanna/Priya Nair, 21-16, 21-18; BMX: DJ Peters/Neha Rajendra def. Cameron Ohoro/Amber Beeney, 13-21, 21-15, 22-20; SMX: Naren Koka/Lan Xu def. Doug Towne/Marsha Morris, 19-21, 21-16, 21-15. JUNIOR CHAMPIONS: U9 BS- Byron Mee; U11 GS- Kiseki Hashimoto; U11 BS- Rahul Jayaraj; U11BD- Dominic Kwan/Rahul Jayaraj; U11 MX- Dominic Kwan/ Kiseki Hashimoto; U13 GS- Jordyn Mee; U13 BS- Gabriel Allen; U13 GD- Jordyn Mee/Flora Tao; U13 BD- Gabriel Allen/Rahul Jayaraj; U13 MX- Rahul Jayaraj/Flora Tao; U15 GS- Jordyn Mee; U15 BS- Gabriell Allen; U15 GD- Jordyn Mee/Nikhita Jayaraj; U15 BD- Gabriel Allen/Dominic Kwan; U15 MX- Dominic Kwan/Flora Tao. February 11, 2017, Mesa... As part of our AZBC 5th anniversary celebration, the annual 2017 JIM POOLE CLASSIC took place on Saturday, Feb 11 with about 60 entries competing in singles, doubles and mixed doubles culminating with a special dinner at Lucille's BBQ Smokehouse with Jim Poole himself! Great prizes, food, tournament shirts and competition! Highlights included Vaishnavi Koka taking the Women's Singles and Women's Doubles titles with partner Ashley Nam. Newcomer Nanyi Chen stormed through the draw to win the Men's Singles title. Tejas Asani and Van Ho won the Men's Doubles with a close win in the finals. Seigo Hashimoto and Sherry Yuan cruised to win the Mixed Doubles title. Chacko Kuruvilla won both the Masters Men's Singles and Masters Men's Doubles with partner Shawn McMillen. Complete finals results... WS: Vaishnavi Koka def Gabrielle Nakada, 21-13; WS-Cons: Ekta Kulkarni def Caitlin Halim, 21-13; MS: Nanyi Chen def Seigo Hashimoto, 21-12; MS-C: Charles Wang def DJ Peters, 21-14; MMS: Chacko Kuruvilla def Warren Mee, 21-14; MMS-C: Roger Goettl def Stewart Schwartz, 21-13; WD: Vaishnavi Koka/Ashley Nam def Alexis Mee/Sherry Yuan, 21-7, 21-11; Gabrielle Nakada/Maggie Trias def Alex Corridan/Madi Duyck, 21-9, 21-12; MD: Tejas Ashani/Van Ho def Nanyi Chen/Surya Sarvajith, 24-22, 21-19; MD-C: Sean Carman/Dean Glazeski def Pik Kean/Mitch Nase, 17-21, 21-16, 24-22; MMD: Chacko Kuruvilla/Shawn McMillen def Andrew Pariva/Sameer Kulkarni, 21-15, 21-14; MMD-C: Sean Carman/Stewart Schwartz def Mike Hilliard/Dennis Sullivan, 21-10, 21-12; MX: Seigo Hashimoto/Sherry Yuan def Tejas Ashani/Priya Nair, 21-9; MX-C: Stewart Schwartz/Carrie Davis def DJ Peters/Amber Beeney, 21-9. December 5, 2016, Mesa... The 2016 HOLIDAY FUN! BOWL and AZ HS BOYS STATE BADMINTON CHAMPIONSHIPS brought out the best in both! Along with great competition in the Women and Men Doubles events, and the largest BOYS STATE CHAMPIONSHIPS in Arizona history, some seriously CRAZY MIXED-UP DOUBLES was the hit of the day in the afternoon. Two versions of CRAZY were played where partners were picked out of a hat: 1) Half-Court Chaos-- 1/2 Court Singles with 2 players alternating shots and sharing a racket! 2) Full-court doubles with various handicaps, such as some of the stronger players using a tennis or squash racket and/or hitting with their opposite hand. There were a lot of hilarious rallies, and it was lots of fun for the spectators, too. On a more serious front, the 2016 HS BOYS STATE BADMINTON CHAMPIONSHIPS was the best ever with 8 schools represented, 18 singles players and 9 doubles teams. JR Holloway of Campo Verde led the way as the new HS Boys Singles Champion and finished third with partner Alex Decker in the Doubles. JR and Alex, along with teammates Kyle Decker and Eric Yan, earned Campo Verde the 2016 Arizona Boys Team Badminton title with the most overall points (47). Ray Del Gallo of Basis-Chandler was a one-man wrecking crew just losing out to JR in the Boys Singles Championship match 20-22, and teamed with pick-up partner, Cameron Ohoro of Mountain View to capture the Boys Doubles Championship in a finals over another pick-up team of Brian Lin of Higley HS and Gabe Wilson of Perry. Desert Vistas team of Leo Hsu and Brendon Van finished 4th in the Boys Doubles, and 4th and 3rd respectively in the Boys Singles, and overall finished 2nd in the Team points with 32. Perry's Griffen Haugen, Cooper Richter and Gabe Wilson finished overall 3rd in the Team points (28). To round out the Team finishes, Basis-Chandler finished 4th with 26 pts, Agua Fria - 5th with 20, Mountain View 6th with 16, and Higley and Shadow Mountain tied for 7th place each with 10 points. The Open Women Doubles saw Wey Lyn and Sherry Yu beat Megan Crow and Lana Le in the finals, 21-16. The "B" Women Doubles was won by Prati Lodha and Jordan Ludwig in the finals over Nicole Burton and Jessica Jung, 21-11. The Open Men Doubles title was won by Seigo Hashimoto and Charles Wang in the finals over Sean Carman and Dean Glazeski, 21-18, 21-16. The Senior Men Doubles was captured by Chacko Kuruvilla and Ben Lewis against Roger Goettl and Warren Mee, 21-14, 21-15. September 10, 2016, Mesa... The 2016 SMASH BASH DOUBLES TOURNAMENT lived up to its name once again with 70+ entries pounding away at the bird for winners. There were Open, Senior, Varsity & JV High School Women Doubles, and Open, Senior, and High School Boy's Men Doubles, as well as Open and Senior Mixed Doubles. There were also consolation in each event, so lots of matches, lots of smashes! 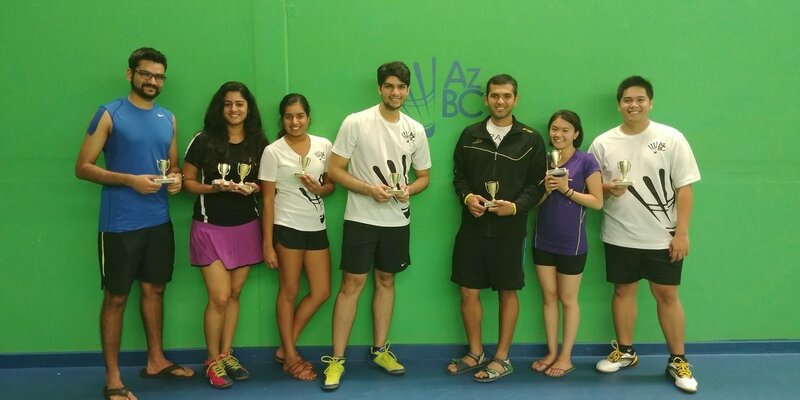 Among the women, there were 3 double winners-- Priya Nair earned the Open Women Double title with Sherry Yuan and Open Mixed Doubles title with Avi Mamidanna. Sherry Yuan also won with Marsha Morris for the Senior Women title, and Marsha Morris also won the Senior Mixed with Doug Towne. Doug Towne also won the Senior Men Doubles with Shash Patel. June 11, 2016, Mesa... The 24th annual Grand Canyon State Games Badminton Event took place at the Arizona Badminton Center. Twenty-nine participants competed in 5 events, Open Women and Men Singles, Women and Men Doubles, and Mixed Doubles. Director Guy Chadwick has been the commissioner for this badminton event since its inception in 1993. The 2016 Badminton Power Player Award went to a very deserving Roger Goetl, who competed in the Men's Doubles after undergoing heart surgery earlier this year, and always volunteers and brings snacks and supplies for all the players to share at every tournament. Congratulations Roger (see photo to left)! Vaishnavi Koka took the Women's Singles Gold and Women's Doubles Gold with Rena Han, and the Mixed Doubles Silver with her father, Naren. Sherry Yu won the Women's Singles Silver and Women's Doubles Bronze with Carrie Davis. Gabrielle Nakada and Riley Chaisson won the Bronze in Women's Singles. Kathy Furtmann and Theo Hashimoto won the Women's Doubles Silver. Theo also won the Mixed Doubles Gold with Senthil Kannappan. Gabrielle Nakada and Alice Wong won the Women's Doubles Bronze. Harsha Gandi earned a Gold in the Men's Singles and teamed with Senthil Kannappan to win the Silver in Men's Doubles. Tejas Ashani and Naren Koka took the Men's Doubles Gold. Chacko Kuruvilla won the Silver in Men's Singles, with Bronze medals going to Dean Glazeski and Stephen Li. The Bronze in Men's Doubles went to Doug Towne and Cacko Kuruvilla and the team of Stephen Li and Wen Wei Liu. The Mixed Doubles Bronze winners were Mike Hilliard and Carrie Davis and Francis Hartojo and Kathy Furtmann. April 16 & 23, 2016, Mesa... Who are the best badminton players in Arizona? Every year that is decided at this tough April event at the AZBC and memorialized on a plaque in the lobby. At the 5th annual AZBC ARIZONA BADMINTON CHAMPIONSHIPS more than 60 competitors put out more energy, more sweat, more gut-it-out effort than ever before! The first Saturday, April 16, played out the Open, "B" and Senior Men and Women Doubles events, and all of the Junior Arizona Badminton Championships. The Open Women Doubles title was won by Kiyoko and Theo Hashimoto. The Open Men Doubles was won by Naren Koka and Karan Kumar. The top junior winners were Jordyn Mee winning the U11, U13, U15 Girls Singles and Mixed Doubles; and Gabriel Allen winning the U13 Singles, Doubles and Mixed, as well as the U15 Mixed. December 5, 2015, Mesa... The 2015 HOLIDAY FUN! BOWL and AZ HS BOYS STATE CHAMPIONSHIPS was jam packed with good competition among 70 participants, BBQ on our front porch with perfect 72 degree weather, and prizes for the best laugh on the court with Maggie Trias and Derek Yu the winners! The Boys High School division produced a new Singles Champion in Derek Yu of Arcadia HS. He beat the top seed Jason Truong of Desert Vista 25-23 in the finals! Jason Truong and Jeffrey Luo battled through for the Doubles title defeating Alex Decker and JR Holloway of Campo Verde HS 21-19 in the finals. The final team results were: Desert Vista HS - 30 pts, Arcadia HS - 22 pts, Campo Verde HS - 16 pts, Basis - 10 pts, Mountain View - 10 pts. The Holiday Fun! Bowl began with nearly 80 matches of 1/2 Court Singles (One 7-pt game) in less than 2 hours! Vaishnavi Koka was the star of the women, and Senthil Kh. won the men's 1/2 Court. Madi Duyck won the girls division. Vaishnavi also teamed with Priya Nair to take the Women Doubles title, Alex Corridan and Madi Duyck won the Girls Doubles, while Naren Koka and Ram K won the Men Doubles. 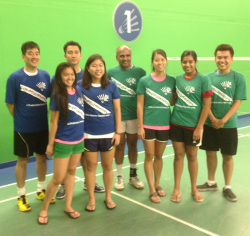 Senthil and Priya teamed to dominate in the Mixed Doubles. There was also consolation for all the events. Alex Liang (foreground) with Dean Schoppe (left) and Yuko Kawasaki (right) in pilot Jim Thatcher's small plane as they prepared to fly to Arizona for the Smash Bash. September 5, 2015, Mesa... The 2015 SMASH BASH featured smoking hot competition in six events: Open Women Doubles, Jr/Sr Women Doubles, Open Men Doubles, Jr/Sr Men Doubles, Open Mixed and Jr/Sr Mixed Doubles. The purpose of the tournament for more than 20 years has been to provide an event where both adult and high school players compete in the same tournament so that local high school players can see higher level play during their AIA season. June 13, AZBC, Mesa... The 23rd Annual GCSG BADMINTON Event was held again at the Arizona Badminton Center on Saturday, June 13, 2015. 25 participants competed in 5 events, including Women and Men Singles, Women and Men Doubles, and Mixed Doubles. Shuhong Liu won the GCSG POWER PLAY AWARD for outstanding sportsmanship. There were two double-Gold Medalists, Tejas Ashani for Men Singles and Doubles (he also won a Bronze in Mixed Doubles), and Doug Towne for Men Doubles and Mixed Doubles. April 18 & 25, AZBC, Mesa... ﻿The 4th Annual AZBC ARIZONA BADMINTON CHAMPIONSHIPS added the first-ever Arizona Junior Badminton Championship events for U11, U13 and U15 age groups, along with crowning several new adult Arizona badminton champions, including one double winner, Kiyoko Hashimoto in OWS and OWD with Kai-Ning Khor. Kiyoko was also last year's OWS champion and the 2012 OWD champion with her mom, Theo. Art Solo won the OMS, and he and Kiyoko lost a tough 3-game match in the finals to the OMX champions Naren and Vaishnavi Koka. The OMD was won by Bui Hoang and Anton Kentjana. It was especially gratifying to see the young kids, including several 9-year olds playing in their first tournament. With the recent boon of AZBC KIDS CLASS participation we knew it was time to hold the first junior tournament. There were lots of happy faces to go with some occasional tears. It was a great experience for the kids and parents. In addition, the HANK ANDERSSOHN MEMORIAL EAGLE AWARD was given this year to Mike Hilliard for his years of dedication to the sport of badminton in Arizona along with his numerous senior national titles and outstanding sportsmanship. Mike is a constant volunteer at the AZBC and an inspiration to everyone! Dec 6, AZBC, Mesa... The 3rd Annual HOLIDAY FUN BOWL & ARIZONA HIGH SCHOOL BOYS STATE CHAMPIONSHIPS combined tournament was the largest to date. More than 60 competitors including 12 high school boys representing 7 different high schools participated. More than 130 matches were played from 9am - 6pm, including the HS Boys Singles and Doubles, Men & Women 1/2 court singles, Men & Women Doubles, and Mixed Doubles events. The tournament began with the high school boys competition along with the fun 1/2 court singles event for both men and women. The HS boys played a 12 player straight draw with Loris Pfammatter of Skyline dominating for the HS Singles Title. The Highland team of Jake Bingham and Harrison Faas (pictured above with Highland Badminton Coach, Gene Valocchi) won the hard-fought HS Doubles title and also each made it to the semifinals in the Singles to edge out Skyline for the overall BOYS STATE TEAM title. Tied for 3rd place overall were Desert Vista (Jeffrey Luo, Jason Truong) and Mesa (Josiah Acob, Tolga Oezsabunca). Hamilton (Alfred Chang) finished 5th, and Basis (Ray Del Gallo) and Campo Verde (Alex Decker, J.R. Halloway) finished tied for 6th. The Holiday Fun Bowl events saw Seigo Hashimoto win the Men's 1/2 Court Singles, Emily Harris win the Women's 1/2 Court Singles, Alexis Mee and Kirielle Singarajah win the Women's Doubles, Guy Chadwick and Chin Khor win the Men's Doubles, and Art Solo and Kiyoko Hashimoto win the Mixed Doubles. There were also B, C, and Consolation division winners in the Men, Women, and Mixed Doubles. Special sportsmanship awards were also given to Mike Hilliard and Nga Le. ﻿Sep 6, AZBC, Mesa... The 22nd Annual SMASH BASH BADMINTON DOUBLES TOURNAMENT included exciting matches in Women's Doubles, Men's Doubles and Mixed Doubles, and a special presentation of the "Hank Anderssohn Memorial Eagle Award" to long time high school badminton coaches Nancy Funari and Lois Emshoff. Coach Funari (on the left in the photo above) of Carl Hayden High School coached from 1965 - 2001 until she retired! Coach Lois Emshoff could not make the presentation at the last minute, but she continues to coach into her 50th year at Chandler High School!!! Both coaches have made invaluable contributions to the badminton community in Arizona through all these years-- Thank you Nancy and Lois! The Women's Doubles featured champions Theo and Kiyoko Hashimoto and the Men's Doubles champions Steve and Seigo Hashimoto. Kiyoko also teamed with Art Solo for the Mixed Doubles championship! There were some amazingly exciting matches in each event, including two consecutive 3-game match wins for WD finalists Chandler Begay and Nga Le; a 3rd game, 23-21 win for Art Solo and Kiyoko Hashimoto over the #1 seeded team of Avi Manidanna and Priya Nair in the Mixed Doubles semis; and a 3-game thriller in the MD finals, with Steve and Seigo Hashimoto prevailing over Naren Koka and Doug Towne, 21-19, 20-22, 26-24 in one of the closest matches in recent AZ tournament history. FINAL RESULTS: WD-1: Hashimoto/Hashimoto def. Begay/Le, 21-15, 21-14; WD-2: Nair/Nam def. Mee/Singarajah, 21-16, 21-16; WD-3: Nieves/Weldon def. Coria/Valdez, 21-13, 21-12; WD-4: Chaisson/Qindeel def. Bracken/Bracken, 23-21, 15-21, 21-15. MD-1: Hashimoto/Hashimoto def. Koka/Towne, 21-19, 20-22, 26-24; MD-2: Lim/Pariva def. Ashani/Hartojo, 21-16, 18-21, 21-15; MD-3: Goettl/Kommasandra def. Glazeski/Singarajah, 18-21, 21-14, 21-16. MX-1: Solo/Hashimoto def. Hashimoto/Hashimoto, 21-17, 21-18; MX-2: Hashimoto/Yuan def. Hartojo/Nam, 21-17, 21-15; MX-3: Singarajah/Mee def. Mee/Singarajah, 21-2, 14-21, 21-16; MX-4: Shrikant/Shrikant def. Kommasandra/Scheeland, 21-19, 22-20. ﻿﻿﻿June 14, AZBC, Mesa... ﻿﻿The 22nd annual GCSG Badminton Event was held at the AZBC on Saturday, June 14 with women singles, men singles, women doubles, men doubles, and mixed doubles played. Kirielle Singarajah won 2 Gold medals taking the women singles and women doubles title with Alexis Mee, who also won a bronze in mixed. Art Solo won the Gold in men singles, Silver in men doubles with Joseph Kaamino, and Bronze in mixed with Alexis. 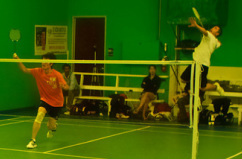 Chris Hsieh and Van Ho won the men doubles Gold. Avinash Mamidanna and Priya Nair won the mixed Gold. Kirielle's father, Clement, won the POWER PLAY award for exceptional sportsmanship, character, huge smiles and lots of fun on and off the court. ﻿﻿﻿May 17, AZBC, Mesa...﻿ Badminton continues to grow in Arizona and for some time we have wanted to establish a basic ranking system. 'A' for advanced, 'B' for intermediate, and 'C' for novice/beginner. These are not clearly defined levels of play, but give a general guideline to help tournaments provide more opportunities for developing players. The 2014 AZBC 'B-C' Spring Challenge is really the first Arizona tournament to focus on the 'B' and 'C' level players using a 'B' drop 'C' format for WS, MS, WD, MD, MX without the "intimidation" of having 'A' players around. The result was several players playing in a tournament for the first time and lots of hard fought matches throughout. Beibei Sun (see photo to the left by Mike Hilliard) won the triple crown in the 'B's-- BWS, BWD with Sherry Yuan, BMX with Shaohua Li. Shaohua Li also won the BMS. Looks like it is time to move Sun and Li up to an 'A' ranking! Additional results are as follows: BWS: Beibei Sun def. Sherry Yuan, 21-10, 21-19; BWS-Cons: Samantha Berg def. Maryann Stegall, 21-11; CWS: Alexis Mee def. Jaime Rostron, 21-15, 17-21, 21-9; CWS-Cons: Kiana MacDonald def. Meghan Marshall, 21-19; BMS: Shaohua Li def. Mike Hilliard, 21-8, 21-16; BMS-Cons: Gino Canez def. Rafi Sadek, 21-18; CMS: Murali Krishnan def. Dean Glazeski, 16-21, 21-17, 21-12; CMS-Cons: Ken Lee def. Tom Leong, 21-17; BWD (4 team round robin): 1st: Beibei Sun/Sherry Yuan, 2nd: Karen Guo/Alexis Mee, 3rd: Kiana MacDonald/Maryann Stegall, 4th: Samantha Berg/Haley Lesar; BMD: Warren Mee/Art Solo def. Mike Hilliard/Rafi Sadek, 21-14, 21-18; BMD-Cons: Dean Glazeski/Tom Leong def. Gino Canez/Shaohua Li, def; CMD: Marcus Allen/Jason Grey def. Vishwas Gowda/Murali Krishnan, 21-19, 12-21, 23-21; BMX: Shaohua Li/Beibei Sun def. Rafi Sadek/Sherry Yuan, 21-11, 21-19; BMX-Cons: Art Solo/Kailee Grey def. Murali Krishnan/Kirielle Singarajah, 21-19; CMX: Vishwas Gowda/Erlinda Singarajah def. Jason Grey/Kailee Grey, 21-10, 21-12. April 19 & 26, AZBC, Mesa... The 3rd annual Arizona Badminton Championships brought more than 60 competitors to the AZBC courts on consecutive Saturdays. The doubles and mixed doubles events were held on Saturday, April 19 and the singles events on April 26. As a result, more singles players participated with greater energy and focus. An Open-drop B format and a Senior division also added depth to the events. This year crowned several new champions in each of the events. On the first Saturday, Guy Chadwick and Yukari Katayama teamed to win the Open Mixed Championships. Katayama paired with Miki Honda to win the Open Women Doubles. Chadwick and Peter Huang took the Men Doubles title. On the second Saturday, Kiyoko Hashimoto won the Open Women Singles and 19-year old Chinese exchange student at U of A, Henry Zeng grabbed the Open Men Singles title. There were lots of tough matches throughout the tournament, including in the B and Senior events. For example, Ramesh Bondalapati and Albert Sue battled against each other in back-to-back marathon B Men Singles and Senior Men Singles matches, both going 3-games, with Albert winning the BMS and Ramesh winning the SMS! January 25, AZBC, Mesa... 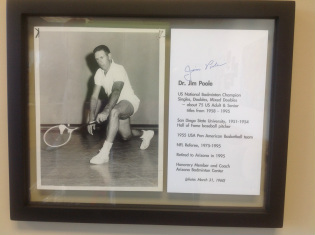 In honor of U.S. badminton legend, Arizona resident and AZBC member, our annual Open and Masters Classic has been named the JIM POOLE Badminton Classic. 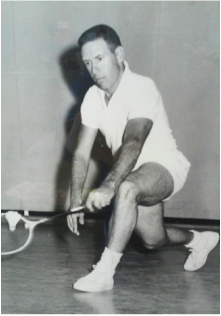 Jim won some 75 U.S. national titles from 1958 - 1995 in singles, doubles and mixed doubles! He was also a Hall of Fame baseball pitcher at San Diego State University in the mid-1950s, played on the U.S. Pan American basketball team, was a university professor, and a highly regarded NFL referee for 20 years. At his peak in the early 1960s, Jim was ranked in the top 5 in the world. He was a fierce competitor known for his precise, deceptive, and powerful left-handed shots. 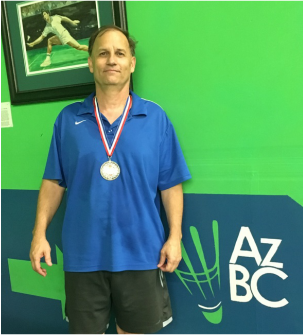 Jim continues in his retirement years by helping coach at the AZBC HL Badminton Academy and other players of all ages at the AZBC. It was a privilege to have Jim attend the tournament. The tournament featured Open Women Doubles, Open Men Doubles and Open Mixed Doubles, and 5 Masters doubles and mixed events. In the Open Women Doubles, Californians Jurate Foes and Jacky Myers defeated locals Kiyoko Hashimoto and V Koka in 3 games. Guy Chadwick and Steve Hashimoto beat Seigo Hashimoto and Bui Hoang in the Open Men Doubles, 21-12, 27-25. Bui Hoang and V Koka won the Open Mixed title, 21-11, 21-15 over Hong Hu and Yuko Kawasaki (CA). In the Masters events, Kathy Furtmann and Jurate Foes won the 90 Women Doubles. Anton Kentjana and Colin Taylor (CAN) won the 90 Men Doubles. Cholik Chan and Steve Hashimoto won the 100+ Men Doubles in a 3-way tie giving up the least points. Pedro Garcia and Jurate Foes won the 90 Mixed Doubles. Pedro Garcia and Jacky Myers won the hotly contested 100+ Mixed event. We concluded with a fantastic tournament meal at Lucille's Smokehouse BBQ in the Tempe Marketplace with Jim Poole co-hosting! We are looking forward to next year's JIM POOLE CLASSIC with even more local and out-of-town players! December 7, AZBC, Mesa... In a tournament highlighting "interesting" events, such as men's and women's half-court singles and the 3-person net rotation game involving 16 teams of 3 players each, along with the standard men's & women's doubles with lots of round robin play, AND the 2nd annual ARIZONA HS BOYS STATE BADMINTON CHAMPIONSHIPS, perhaps the most fun of all was the introduction of the "Most Interesting Man & Woman" award! Most Interesting Woman & Man Award winners were Sherry Yuan and Naren Koka - see photo. We always value good sportsmanship, so we took it up another level with this new award. With several different nominees in the running, it was the big smiles, great sportsmanship and the fact that Sherry has twin very cute daughters and Naren likes to kill people with his smash that set them apart this time. The half-court singles had 32 women and 16 men competing in open and consolation draws playing quick 7-point games-- providing rapid-fire excitement and a great way to warm up for the rest of the tournament. Kai-Ning Khor defeated Nga Le in the women's finals 7-3 and Bui Hoang defeated Naren Koka 7-5 for the men's title. The 3-Person Net Rotation Game was full of totally unpredictable results with the team of Roger Goettl-Sydney LaPierre-Brittany Fielden beating Aditya Vaidya-Lauren Eyring-Colleen Ridge in the championship match 7-5. 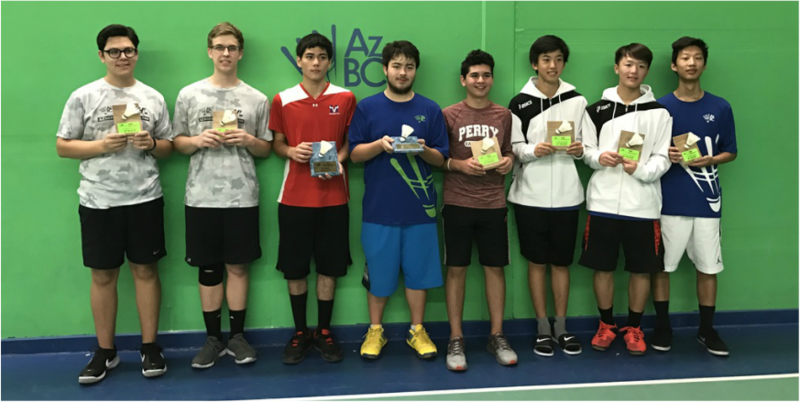 The Arizona HS BOYS State Championships is held to give a place for high school boys to have competition outside of helping the high school girls practice during their fall AIA High School Badminton season. This year just 3 boys competed, Josiah Acob and Benjamin Meek from Mesa High and Alfred Chang from Hamilton HS. Alfred won the singles title with wins over Josiah and Benjamin, but with Alfred's partner failing to show, the Mesa boys won the doubles title by default and with it the over all team title for Mesa. The most interesting match was a singles match deciding 2nd place between Josiah and Benjamin which lasted more than an hour with a final score 15-13, 14-17, 17-15 in favor of Josiah. The women's and men's doubles completed the day with 16 women's teams in 4 pools of 4, and 10 men's teams in 2 pools of 5. The pool play placed teams in the championship rounds or the consolation rounds depending on their finish. Everyone played a minimum of 5 matches. In the championship matches Chandler Begay and Nga Le won the ladies doubles 21-17, 21-16 over Kai-Ning Khor and Ashley Nam, while Bui Hoang and Chin Khor beat Naren Koka and Mike Hilliard 21-13, 13-21, 21-17 for the men's title. September 7, AZBC, Mesa... School is back in session and the local high school badminton season is underway. The SMASH BASH from its origin was designed to expose high school players to higher level tournament action. Not only do they get lots of play in their Varsity and JV divisions, but they also play in the Open Women division and see the Open Men compete. This year's SMASH BASH saw high school players each play 8 - 11 matches with the round-robin Olympic style format! This year's SMASH BASH Champions... Varsity Girls Doubles: Kiyoko Hashimoto & Vaishnavi Koka; JV Girls Doubles: Karen Guo & Juliette Xiong; Women's Doubles: Kiyoko Hashimoto & Monica Xiong; Men's Doubles: Steve Hashimoto & Bui Hoang. Photo from left to right: Steve Hashimoto (MD Champion), Kiyoko Hashimoto (VD & WD Champion), Bui Hoang (MD Champion), Monica Xiong (WD Champion), Naren Koka (MD 2nd), Kai-Ning Khor (WD 2nd), Vaishnavi Koka (VD Champion, WD 2nd), Seigo Hashimoto (MD 2nd). June 22, AZBC, Mesa... We have run the Grand Canyon State Games badminton event every year since the Games began in 1993, but this was the first time at the AZBC! We changed the format somewhat to include just the 3 events, Women's Doubles, Men's Doubles and Mixed Doubles but added a round-robin Olympic style format so that participants played in many more matches. There was lots of exciting matches and very tired competitors by the end of the day. Bui Hoang (photo at left courtesy of Clement Singarajah) was a double-Gold Medal winner teaming with Chin Khor to take the Men's Doubles title and teamed with Chin's daughter, Kai-Ning, to take the Mixed Doubles. Yukari Katayama won the Gold Medal in Women's Doubles with Kiyoko Hashimoto and the Silver Medal in Mixed with Saburo Sakai. A special POWER PLAY award for sportsmanship and character is also given at each GCSG's event and this year the POWER PLAY went to the entire Hashimoto family! Not only do the Hashimotos -- Steve, Theo, Seigo, Kiyoko (and little Kiseki) -- play at a high level, winning 8 medals among them, but they are a joy to have participate with their extraordinary sportsmanship. Below are the tournament results. 2013 A-B-C SUMMER DOUBLES SHOOT OUT! June 1, AZBC, Mesa... It was the hottest day of the year in Arizona to-date and so was the action on the AZBC courts as everyone played 5 matches in round-robin pools for women's doubles and men's doubles. When the smoke had cleared there were "A" Champions, "B" Champions, and "C" Champions left standing in each division. The six women's teams played a complete round-robin among themselves with the top 2 teams designated as "A", the 3rd and 4th finishers designated as "B", etc. The 12 men's teams played in 4 groups of 3 teams round-robin with the 1st, 2nd, and 3rd place teams in each pool graduating into a round-robin pool of 1st place finishers, 2nd place finishers, and 3rd place finishers playing for the "A", "B" and "C" championship titles. April 13, AZBC, Mesa... The annual Arizona Badminton Championships places the top Arizona badminton players in the record book. This year we saw many new champions receive plaques and have their name etched on the perpetual trophy on display in the AZBC lobby. Two players were double winners: Kai-Ning Khor won the OWD with Vaishnavi Koka and the OMX with Bui Hoang; and Hong Hu won the OMS and the OMD with Guy Chadwick. In the OWS, Monica Xiong edged Vaishnavi Koka in a hard fought final, 21-15, 23-21. Feb 1-2, AZBC, Mesa... After a friendly "Challenge Cup" series of games on Friday evening, Feb 1 between AZBC players and out-of-town players (AZBC won 5-2!) there was non-stop intense competition from 9am - 8pm on Saturday, Feb 2 in five events-- Open Women Doubles, Open Men Doubles, Senior Women Doubles, Senior Men Doubles and Open Mixed Doubles, which included players from CA, WY and NEV, as well as a strong contingent from Tucson. 32 women and 29 men battled it out for the various titles and enjoyed an outdoor BBQ between matches. The big winner was Yukari Katayama who won the triple crown with straight game victories in OWD, SWD and OMX. Final results below. OWD- Theo Hashimoto/Yukari Katayama def. Kai-Ning Khor/Vaishnavi Koka 21-19, 21-6. Jan 5, AZBC, Mesa... The 2013 New Year's Badminton Fest brought out the best of BBQ, food and badminton in a half-day tournament from Noon - 6pm. The weather cooperated perfectly again allowing time to relax between matches out by the grill. Forty gladiators battled in Open Women Doubles, Open Men Doubles, and an encore "Mixed-Up" Doubles event with most of the teams picked out of a hat. 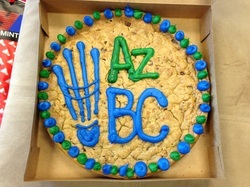 One highlight of the tournament was the giant chocolate chip cookie decorated with the AZBC logo courtesy of the Goettl family! Obviously, it didn't last long, so it was good the photo at right was taken. Darcy Frear and Monica Xiong won the OWD over Vaishnavi Koka and Kai-Ning Khor. Rachel Goettl and Brittany Puruggannan won the OWD consolation. Guy Chadwick and Mike Hilliard defeated Bui Hoang and Chin Khor for the OMD title in 3 games, with Giao Quach and Mark Tsang winning the OMD consolation. 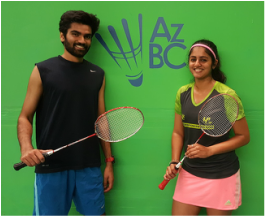 Finally, in a remarkable run of matches, Ashish Pingale and Monica Xiong battled through the "Mixed-Up" Doubles draw winning every match by the narrowest of margins, including a first round 30-29, 16-21, 23-21 victory and a 3-game finals win over #1 seed Bui Hoang and Kai-Ning Khor. Mark Tsang and Darcy Frear won the "Mixed-Up" consolation. Thanks again to HL and Verve for sponsoring the tournament! It was a great way to start off the New Year! Dec 1, AZBC, Mesa... The 2012 Holiday Fun Badminton Bowl was a raging success and lived up to its name! We set up a bar-b-q grill, tables, chairs and additional food tables outside along with a sponsorship tent by Russell Nelson and VERVE, to go with a full day of great badminton play at the Arizona Badminton Center. VERVE provided special participant give-aways and prizes for the winners and runners-up to go along with additional prizes from Warren Mee, Mike Hilliard, and the AZBC. The tournament was formatted to be extra fun with divisions for beginners, intermediate and advanced in events including 1/2 court singles, regular men's and women's doubles, and a "mixed-up" doubles. Playing just one 7-point game for each match in the 1/2 court singles, 48 players competed in four divisions with consolation play. In just over an hour the champions were determined: Anton Kentjana in the Open Men's, Chris Mann in the Intermediate Men's, Liz Aronsohn in the Open Women's, and Rachel Price in the Intermediate Women's. In the regular doubles full rally scoring matches in six different divisions were held with lots of hard-fought competition. The finals were: Open Women- Liz Aronsohn/Courtney Foltz def. Chandler Begay/Nga Le, 21-16, 21-18. Intermediate Women- Rachel Price/Valerie Rozon def. Brianna Carter/Emily Tobler, 21-9, 21-8. Beginner Women- Danielle Torres/Patty Willis def. Sidney Arohsohn/Martin Eslava, 21-12, 21-11. Open Men- Bui Hoang/Chin Khor def. Guy Chadwick/Toto Guhathakurta, 21-13, 21-16. Intermediate Men- Heiwei Lu/Shuhong Liu def. Albert Sue/Sherry Yuan, 14-21, 21-19, 21-18. Beginner Men- Roger Goettl/Clement Singarajah def. Garin Chadwick/Alyssa Litwin, 21-19, 22-20. In the "Mixed-Up" Doubles 24 players were picked out of a hat to form 12 teams playing one game matches to 21 points rally scoring. Bui Hoang/Sherry Yuan def. Doug Towne/Marsha Morris 21-11 in the finals. Chris Hsieh/Courtney Foltz def. David Levin/Lan Xu in the consolation finals, 21-17. In addition to the competition prizes, a special recognition was given to Naren Koka as the 2012 Hank Anderssohn Memorial Eagle Award recipient. Oct 20, Arizona Badminton Center, Mesa, AZ... The first-ever 2012 HIGH SCHOOL BOYS STATE BADMINTON CHAMPIONSHIPS were held at the Arizona Badminton Center on Saturday, October 20. Seven boys representing 5 different high schools battled it out for the individual singles and doubles titles and overall team title. Richard Quach of Mesquite High School took the singles title and doubles title with partner Kurt Knapp, who also finished 2nd in the singles. Highland High School brothers Nick and Jake Bingham finished third and fourth in the singles and second as a doubles pair. Mesquite HS captured the team title, Highland HS finished 2nd overall, Kar Ken Chang of Hamilton HS finished third overall, Josiah Acob of Mesa HS finished 4th, and Boris Dimov of Shadow Mountain HS finished 5th. On consecutive Saturdays, April 21 & 28, 2012, the Arizona Badminton Center hosted the first annual Arizona Badminton Championships to determine the top Arizona-based badminton players in open men's and women's singles, open men's and women's doubles, and open mixed doubles. It was also the first-ever tournament played at the AZBC, which officially opened its doors in February. There were many close, hard-fought matches including 17 three-game matches during the tournament. Commanding the victory stand was triple-crown winner Bui Hoang of Phoenix, who captured the Open Men's Singles, the Open Men's Doubles with Say Diep of Chandler, and the Open Mixed with Vaishnavi Koka of Chandler. Darcy Frear of Tempe won the Open Women's Singles. The mother-daughter combination of Theo and Kiyoko Hashimoto of Maricopa won the Open Women's Doubles. A perpetual plaque honoring the state champions hangs in the lobby of the AZBC. The 20th annual Smash Bash Doubles Tournament was held at the new Arizona Badminton Center on Saturday and Sunday, September 8-9, 2012. Continuing a long tradition of showcasing both open events and high school events, there was non-stop doubles action all weekend. On the first day, Varsity High School Doubles ended with Geneva Heinkel and Sabrina Martinez defeating Courtney Foltz and Sarah Wax. The Open Women's Doubles team of Jayashree Nair and Yukari Katayama defeated Theo and Kiyoko Hashimoto. The Open Men's Doubles team of Guy Chadwick and Hong Hu upset Steve Hashimoto and Bui Hoang. On the second day, Open Mixed Doubles filled most of the court time punctuated by round robin matches for Senior Men's Doubles and Family Doubles. 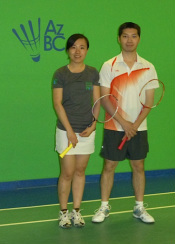 Bui Hoang and Kai-Ning Khor won out in a large Open Mixed Doubles draw. Guy Chadwick and Naren Koka won the Senior Men's Doubles. Shibu Bhavanan and Jayashree Nair (brother and sister) won the Family Doubles.